Yvonne from the Fifth Tine recently shared her love of aged balsamic vinegar. She is fancy and makes delicious food, so this did not surprise me. But balsamic on ice cream? Now we're talking. If you are currently unemployed/short on funds, a pricey bottle of aged balsamic is probably not on your shopping list. Fear not. You can use your cheap bottle of balsamic that you have in your pantry and simply reduce it on your stove-top. (Thank you TasteDuds for the tip!) This enriches the flavor without enriching the cost. Simply pour a little balsamic in a small sauce pan, and let it reduce by half. 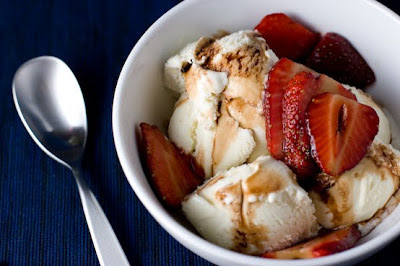 Let cool, mix with sliced strawberries and serve over vanilla ice cream. I'm not going to say it tastes like chocolate sauce, but it's good!